If you have a stash of fabric scraps you don't know how to use, then a scrap quilt is the perfect project. Whether you're interested in stitching a fun play mat or a couch quilt to cuddle under, these free scrap strip or "I Spy" quilt patterns are sure to spark your creativity. Both are fast, easy, eye-catching, and require no special skills. 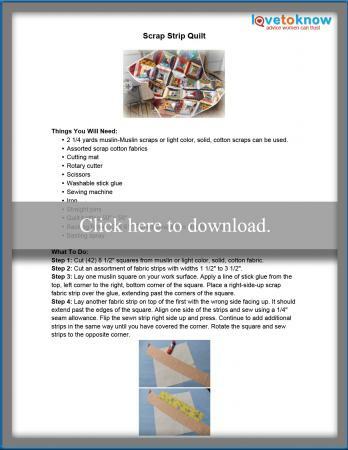 Instructions are available to download and print for your convenience by clicking on the miniature pattern image, or utilize the information at Guide for Adobe Printables for additional assistance. The strip quilting technique is done by sewing scrap strips of assorted widths directly onto a fabric foundation. The foundation can be any size and shape, but for this pattern uses an 8 1/2" square. This quilt is perfect for a throw quilt, but you can alter it easily to be larger or smaller for use on a bed or as a wall hanging. Keep the kids busy and happy while in the car, on the sidelines of a sporting event, or during a snow day with this I Spy quilt mat. This quilt uses a variety of novelty print scraps as each square is a different image that can be spied. No two squares are duplicated. An abundance of scrap solid fabrics are also used as the borders around each square. The definition for scrap fabric is basically a personal perception. It may be bits and pieces smaller than your hand, leftovers from previous projects, old clothing, or fabric you have acquired with no project in mind. What ever your definition, your scraps can be made into a quilt. 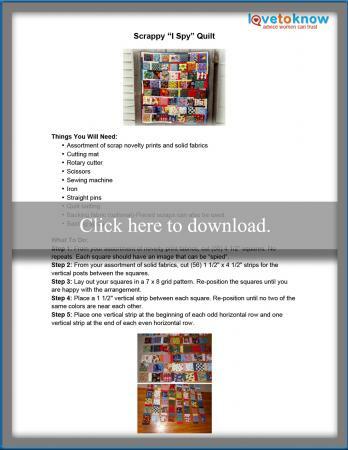 Check out these links for additional free scrap quilt patterns and inspiration. The Reversible Holiday Table Runner at Simply Notable allows you to show off your favorite novelty print scraps. One runner will not be enough! Done in a variety of scrap strips, you will be planning the next one before the first one is finished. This scrappy runner would be a terrific last-minute gift for friends and family. The Easy as Pie quilt pattern offered at Crazy Mom Quilts is simple and charming. A quilting novice will appreciate the simplicity of using rectangles for this quilt top, and a fabric hoarder will love the stash-busting qualities. If you need a simple quilt for sitting on the sidelines of your child's next sporting event, then April Rosenthal's simple Super Scrappy Soccer Quilt tutorial is a great choice. This is a unique idea for sewing a quilt. Scrap fabric squares and rectangles are sewn directly onto the blanket's layers, basically quilting as you create the quilt top. The edges of easy scrap are exposed and will fray beautifully when the quilt is washed. The free Scrappy Summer Quilt Pattern at Cluck Cluck Sew is a fabulous way to use up an abundance of scrap bits. The 4-patch/square block combination makes this a versatile pattern for a quilt of any size. If you have a large collection of fabric scraps but making a quilt seems overwhelming, consider scaling it down. Any quilt pattern can be made using scrap fabric, and there are many small projects you can create. Pillows, purses, potholders, eye glass cases, and coasters are just a few ideas you can complete in just an hour or two.